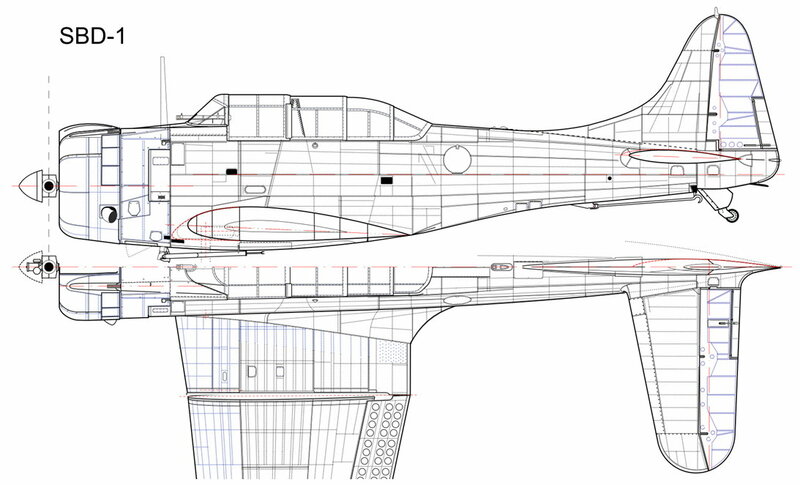 In this last post about scale plans I will write about the modifications introduced in the SBD-5 Dauntless version. 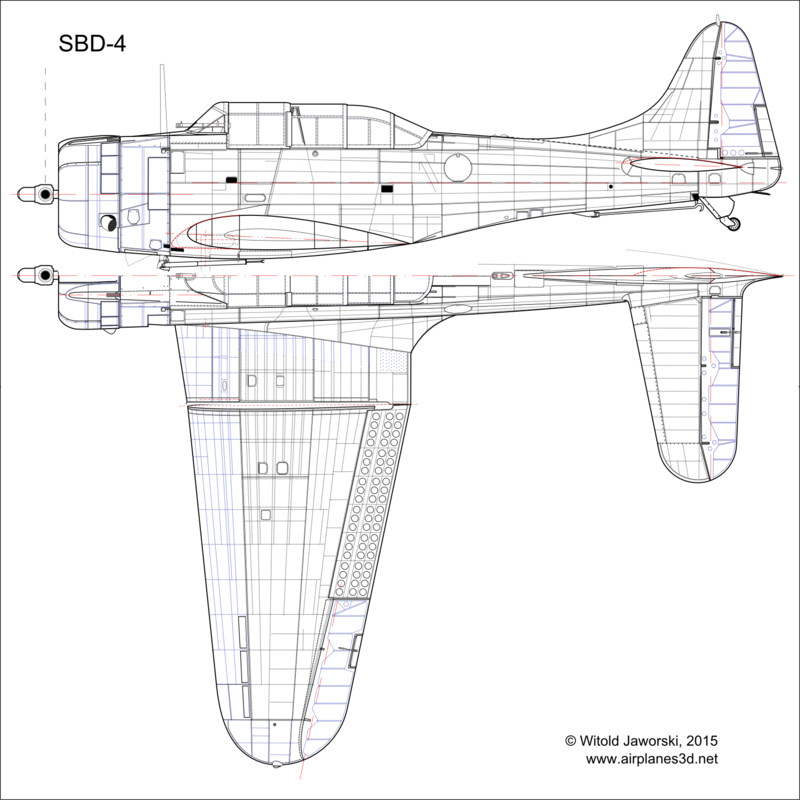 (See the high-resolution SBD-4 left & top view). To recapitulate my work on the Dauntless plans, I decided to draw all the external differences between its subsequent Navy versions. Because of the numerous changes that occurred in the SBD-5, I decided to split this description into two posts. 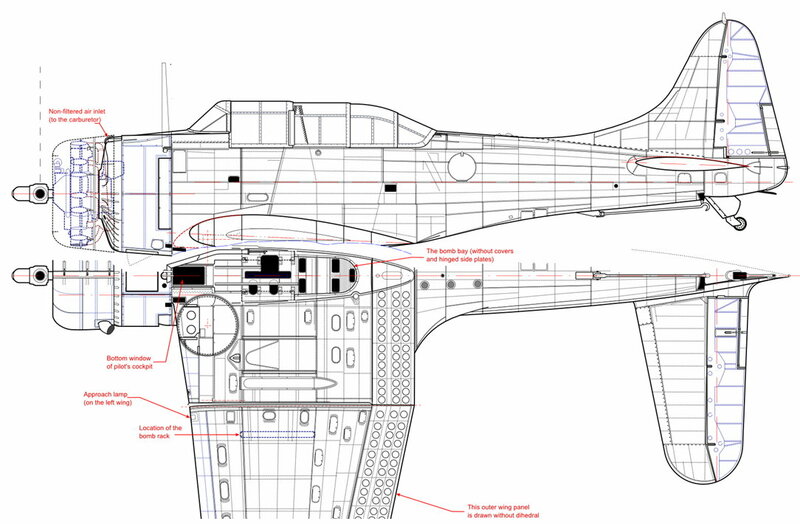 This is the part one, the part two (about the SBD-5 and the SBD-6) will be ready in the next week. NOTE: All airplanes on the drawings below are equipped with the small tail wheel with solid rubber tire (for carrier operations). However, for ground airfields Douglas provided alternate, pneumatic, two times larger wheel. These tail wheels could be easily replaced in workshops. 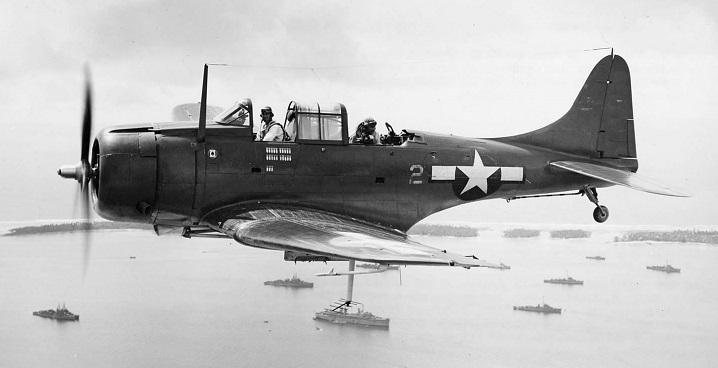 (See the high-resolution SBD-1 left & top view). 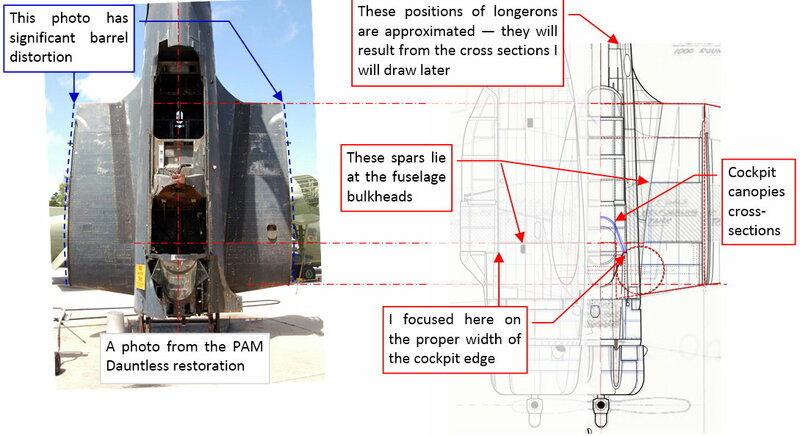 Drawing the vertical views (from the top and bottom) of the SBD Dauntless was more difficult than the side view, because there were no “vertical” photos which you can use to verify and enhance the available plans. 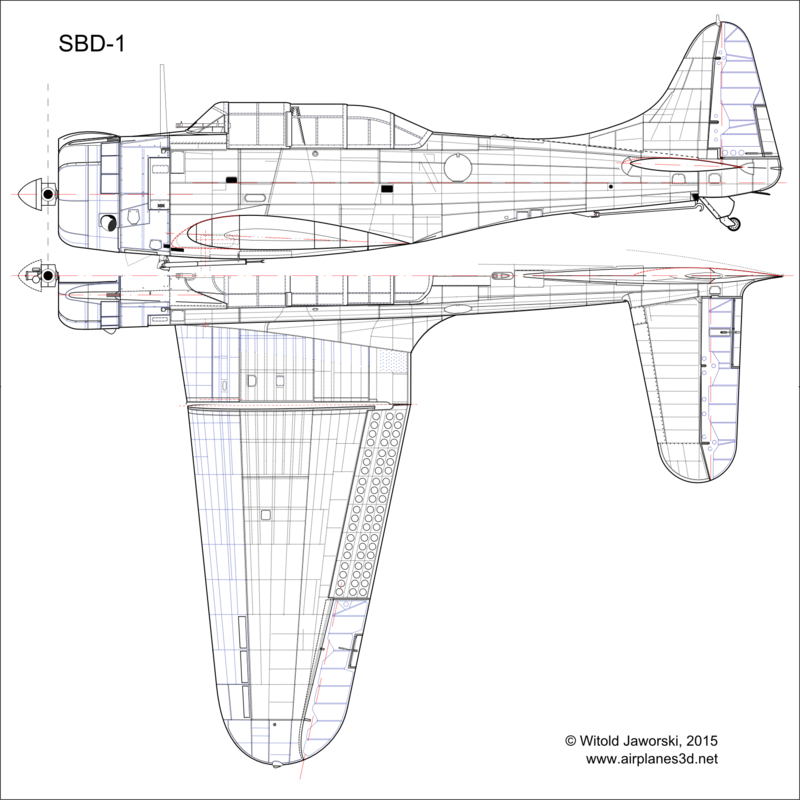 In my previous post you can find the updated scale plans of the SBD-5 Dauntless, consisting the side and top views. The ultimate shape of depicted airplane resulted from matching my initial drawings against the Douglas general arrangement diagram. I couldn’t do it before, because this diagram comes from the Dauntless maintenance manual, which I received in previous week. This Monday I finally got the “Instructions for the Erection and Maintenance of the Model SBD-6 Airplane” book – more than 600 pages about the Dauntless, published by Douglas in March 1944. 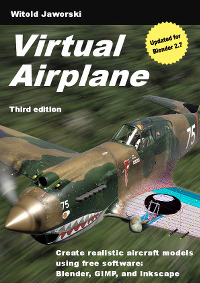 Because of the lengthy title, I will refer to this book as the “SBD Maintenance Manual” or the “Douglas manual”. In spite that it describes the last produced version, it is also usable for the earlier models: as I mentioned in one of the previous posts, the SBD-1 airframe behind the firewall differs only in a few details (the double gun mount, gunsight type, lack of the YAGI antennas) from the SBD-6.